All Mustard Seeds come from just a few members of the cabbage family. 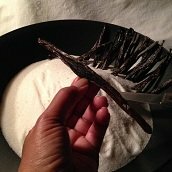 Brown and black seeds are the most closely related, and brown ones, the smaller of the two, have largely displaced the black ones in cooking. Black seeds continue to be used in the dishes of India. The milder white mustard plant (Alba) produces large yellow-beige seeds used extensively in the United States for prepared mustards. German prepared mustards, dark and smooth, are made from brown and black seeds. Most mustard powders are a blend of two or more seeds (e.g., white and black, brown and black). Turmeric Spice provides yellow coloring. The name "mustard", a blended derivative of Latin and French words, means burning must. The burning refers to the spicy heat released by crushing mustard seeds, and must is unfermented grape juice used to make prepared mustard. The amount of coat (hull) of the seed left on and included in prepared mustards determines their strength. Mild mustards have more hulls in them. 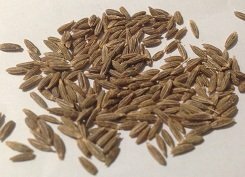 Wholegrain mustard is made with whole seeds (seeds with their hulls). Dijon Mustard, made from mustard seeds, vinegar, citric acid and salt, is the one used to flavor mayonnaise. Gai is a spicy Chinese mustard made from brown seeds. Karashi, used in soy dipping sauces, is a hot potent Japanese mustard. What is the Origin of Mustard Seeds? The true history of this spice is unknown; some say that its roots are in the Northern Hemisphere. It has been around for thousands of years, and has been in use since ancient civilizations. 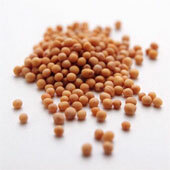 It is believed that White mustard seed is indigenous to the Mediterranean region. Mustard acts as a preservative and is good for recipes such as chutneys and recipes. This spice is good for foods like: beans, beef, beets, Brussels sprouts, carrots, cauliflower, game (rabbit, venison) cheese dishes (macaroni and cheese, soufflés, fondues), chicken, ham, lamb, meatloaf, pork, prepared mustards, tuna, and turkey. What Are the Health Benefits of Mustard Seeds? 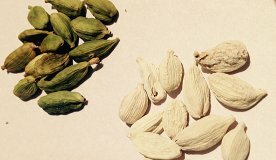 They can aid digestion, and may work as a laxative.